The following post is written by Conor Byrne, a British university student interested in cultural, gender and social history, focusing in particular on English history 1450-1600 in relation to aspects of gender, society, and culture. Tudor history enthusiasts will be excited to discover that a very interesting book has just been published, written by Susan Bordo: The Creation of Anne Boleyn. This is not a historical biography, but instead, Bordo explores how Anne has been ‘created’ throughout history by different people, according to their prejudices, beliefs and culture, through a variety of mediums including film, theatre and novels. As someone who has been researching the life of her tragic, but much less famous, cousin and fellow queen Katherine Howard, I thought it would be interesting to explore how Katherine herself has been ‘created’ over the years according to different beliefs and prejudices. 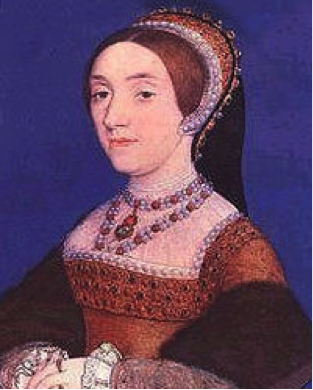 From the time of her execution in 1542 until the nineteenth century, unlike Anne (who enjoyed long-lasting fame due to her status as the mother of the Protestant queen Elizabeth I), Katherine was a non-entity, ignored and forgotten by almost everyone; even her own family had rapidly disowned her at the time of her death. However, with the rise of the study of history in the Victorian period, writers began to pay much greater attention to the reigns of Henry VIII’s queens, lamented by Jane Austen. The austere moral values and the condemnation of ‘fallen women’ in contemporary Victorian society, unsurprisingly, influenced understandings of Katherine’s story as a lesson in morality, as something to be learned from. In relation to Katherine herself, Victorian historians were either hostile, or viewed her with pity – Agnes Strickland, perhaps the greatest female biographer of the age, characterised her as ‘a sheep being led to the slaughter’, but shied away from her shocking career, due to her stifling moral values. In film, Katherine first appeared in the successful 1933 Oscar-winning The Private Life of Henry VIII, with Binnie Barnes presenting her opposite Charles Laughton as Henry VIII. The film centred around the relationship between the king and his fifth wife, marginalising his affairs with his other queens. The result was that Katherine was presented as a more influential and, in a sense, important wife to the detriment of the others than she had ever been in reality. This Katherine was worldly-wise, sophisticated, and incredibly beautiful, but her charm and qualities seemed far more nuanced than the real Katherine’s probably were. The publication of the only academic biography of Katherine, written in 1961 by Lacey Baldwin Smith at a time of the beginning of rebellious feminist politics and swiftly changing views of women, was heavily critical of Katherine, condemning her as ‘a juvenile delinquent’ and a ‘common whore’ who was childish, rash and given to fits of hysteria. Again, we see how the context of the times shaped this interpretation – heavy moral values and the actual imprisonment of juvenile delinquents at the time for crime influenced this historian’s understanding of a queen executed for adultery. Baldwin Smith’s interpretation was very influential in the next portrayal of Katherine in film/TV, in the television series The Six Wives of Henry VIII (BBC, 1970), where she was played by Angela Pleasance. This series was very unsympathetic to Katherine, where she is depicted as a violent, manipulative, hedonistic teenager who threatens her cousin with poison and physical violence and acts in a cruel manner to her ex-lovers. Two years later, however, the most accurate presentation of Katherine emerged in the film of the same name, where the young queen was played by 18-year old Lynne Frederick (tragic in itself, since Frederick died at a very young age). The film perhaps represented growing sympathy to Katherine within England, in highlighting her youth, innocence and naivety, and her hysteria when imprisoned. Indeed, this can be seen as the beginnings of the ‘creation’ of Katherine’s status as victim, continuing into our own day. In David Starkey’s television series (2001), all six wives are presented with a label at the beginning of the program – Katherine’s is ‘victim’. It’s not hard to see why this has happened. The rise of women’s history, feminist politics, and a greater awareness of domestic violence has shaped the creation of Katherine in modern times. Historians have suggested that she was a victim of sexual violence from ruthless predators at court. Her status as victim was exemplified in the British TV movie Henry VIII (2003), where Emily Blunt gives a poignant depiction of a sobbing and screaming Katherine on the scaffold – but again presents her as selfish and driven by her own pleasures. 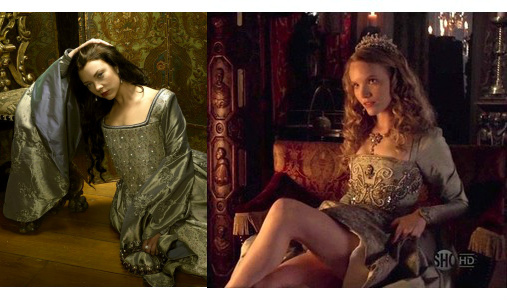 Most recently, in the successful Showtime series The Tudors, Tamzin Merchant gives a very modern portrayal of Katherine as a girl who just wants to have fun. We are encouraged to sympathise with her, but the series presents what people see as a problem in contemporary society – promiscuous girls who think of nothing but their own pleasures. This has shaped people’s views of Katherine. One person I know, who adores The Tudors and Anne Boleyn, once told other people that Katherine was the only ‘slutty’ wife, while defending Anne at every cost. But is this an accurate depiction of the real woman, or merely a view of how she has been presented in film and TV?